Manchester City Women continued their fine form in the Champions League by cementing a 1-0 home win over Danish side Brondby, in the first leg tie of the last 16. After cruising past Zvezda 2005 in the previous round, hitting the Russians for six, City faced a much stronger opposition in Brondby, who have reached the semi-finals of the competition on three occasions. City, who are the only British team now left in the competition, struggled to cause any problems for the visiting side in the first half. Lucy Bronze did provide an effort on goal but the right- backs attempt was saved by the Brondby keeper Katrine Abel. 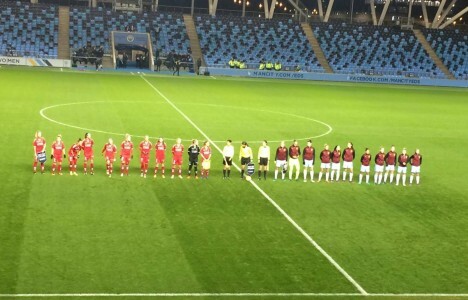 The visitors could have taken the lead through Nanna Christiansen if it wasn’t for Karen Bardsley, the City and England keeper, who produced a fine save to keep the score level going into half time. Scottish striker Jane Ross could have put City in front in the second half. After being put through on goal Ross rounded the Brondby keeper but was denied by defender Simone Sorensen, who was there to intercept and clear Ross’ effort. As the second half progressed so did City. The home side piled the pressure onto the visitors. By the 74th minute, City took the lead. City’s number 24, Kiera Walsh, treated the 1,296 in attendance to a stunning strike from outside the area that nestled into the left hand side of the Brondby keeper’s goal. Brondby could have equalised late on through Katrine Veje whose effort was pushed onto the crossbar by the fingertips of the City keeper Bardsley. This save not only kept City in front but also means City are now yet to concede in 20 games. After the three minutes of stoppage time were played Referee Teodora Albon blew for full time. City now take a 1-0 aggregate lead into the second leg in Denmark, on the 16 November, but their place in the quarter finals is yet to be set in stone.